CHICAGO—High eosinophil counts that can’t be explained should concern rheumatologists and spark attempts to identify what’s happening, an expert said at the ACR State-of-the-Art Clinical Symposium in April. “Eosinophil counts over 1,500 (per microliter) should provoke worry,” said Bruce Bochner, MD, professor of medicine in allergy and immunology at Northwestern University Feinberg School of Medicine in Chicago. He cautioned that a patient with neutropenia will give a false increase in eosinophil percentage and, to obtain the true number, the white blood cell count should be multiplied by the eosinophil percentage. The tip was among many offered in his talk for dealing with eosinophilia (counts of 500–1,500 per microliter) and hypereosinophilia (1,500 or more), which can be a manifestation of a variety of disorders, from allergies to drug reactions to leukemia. The workup of a patient with eosinophilia or hypereosinophilia must be detailed and thorough, Dr. Bochner explained. The cause can be either primary or secondary, and can be characterized by its molecular cause or the organ involved. The treatment depends on the root cause, and expanding therapy options, he said. Hypereosinophila in a patient with gastrointestinal symptoms should prompt concern for eosinophilic gastritis, he said. Two types of eosinophilia due to helminths that “you don’t want to miss” are Strongyloides stercoralis and Ascaris lumbricoides. Even though they are typically contracted in tropical climates, patients can be infected in regions of the U.S., so travel outside the country isn’t required. Strongyloides can disseminate and be lethal, especially if the patient is misdiagnosed and treated with corticosteroids, Dr. Bochner said. Drug reactions with eosinophilia and systemic symptoms (DRESS) are typically marked by a measles-like rash starting two to eight weeks after taking the culprit drug and can prove life threatening, although the mechanisms at play are not well understood, he said. 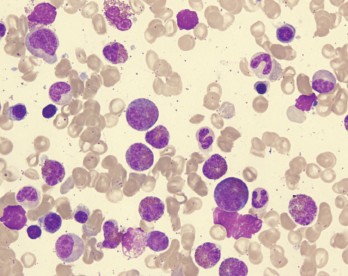 In hypereosinophilia with myeloproliferative features, a gain-of-function deletion mutation has been identified, and the kinase inhibitor imatinib has yielded curative responses. This disorder tends to respond poorly to corticosteroids, Dr. Bochner said. The lymphocytic variant, which can transform to malignancy, is mainly treated with corticosteroids, eventually combined with interferon alpha or other agents.